Entryway, REALSPACE exhibit. Photo: Chuck Spangler. REAL SPACE, so far as we know, really exists. It’s what is from here to over there, the airy in-between through which we pass to arrive at our daily places. It’s our wandering from the bedroom to find coffee and the morning paper, it’s the train station commute to the other end of the line, it’s swinging open the door. It’s anywhere and everywhere we go, fly, swim, dance, crawl and fall – and what we avoid, sit on, step over, and crash into. It’s the natural space whose shapes and names, in’s and out’s, ups and downs, we and every other living thing learn from infancy – the space whose physics we empirically know so well it becomes an extension of ourselves. Humans know real space when they occupy it. We don’t walk straight into solid walls or step off the edges of cliffs – we know too well the personality of our space and how walls and cliffs can trigger unhappy consequences. Instead, we confirm a knowledge of real space in every deft movement we make, by countless reinforcements day-after-day, hammering into our brains’ neurons what is real and what isn’t. We’re skilled experts, dancers in a maze performing the choreography of getting around. We learn to trust in the reality of our space, and we know it’s a bear-hug reality made of physical laws upon which we invest faith and dependence. Our trust rises to a belief – let’s call it realspace, one word – no matter what else we may say we believe in, our actions pledge allegiance to our true belief, in realspace. We worship our corner of it in unceremonial practice, every time we start the car, board a jet, ride an elevator, or avoid falling down the stairs. We walk around on the orbiting spherical satellite of a hydrogen-fusion star floating in a space vacuum, just as sure as we pour milk on our cereal. Realspace is our natural cradle, our true faith, our mystery, our evolution, our cosmos. 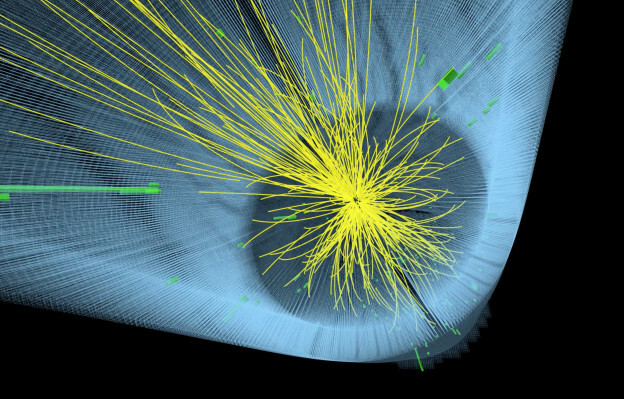 Courtesy/copyright CERN, for the benefit of the CMS Collaboration. Nonetheless, we conjure unreal spaces, spaces we don’t believe in or occupy and from which we are barred physically – spaces of the imagination, of stories and mythologies. Other than metaphorically, we can’t walk around in them, stick our hands inside to fathom their touch, pick their fruit, turn their knobs, or pluck their strings. These are fictional spaces, and most everyone agrees they’re fantasy. They provide the stage-setting for great literature and art, for good stories, myth, legend, and many bad novels. They are places where we vicariously play out stupidly heroic and sweetly ordinary narratives, or the other way around – spaces where we speculate, puzzle, disrupt and bedazzle to send shockwaves back across the real/unreal border, just to spice up reality a bit. We know them to be powerful and wonderful, smart and symbolic surrogates, and our minds can wander carelessly along their cliffs, assured there’s no gravity to yank us into oblivion. 20-inch screen; Terrestrial and extraterrestrial photographs, web browser, custom scrolling code. Left: EARTH Bull Pasture from the end of the trail, Organ Pipe Cactus National Monument, Arizona, USA,Earth; Photo courtesy of The National Park Service. As if real and fictional weren’t enough, however, our ancestors came up with the idea of a hybrid real-imaginary space – the so-called super-natural space. In a quest to fill gaps in their incomplete knowledge of the world’s patterns, humans made stuff up. What explanations they invented sounded reasonable at the time, perhaps, but thus was history’s great fallacy sent careening through time – the meme of the supernatural. And statistically today, it is still believed by most of us to be a bona fide fundamental component of reality. Envisioned as a hidden crawlspace somewhere between the walls of the natural world, the supernatural is a place both close by and far away but nowhere of which anyone is certain. It sneaks across the credulity boundary like a viral invader, vaguely headquartered in the sky, in the ancient aether perhaps, just a ways past the chagrined Ptolemaic universe, concealed in the stars and in the darkness and under our beds. If threatened by reason, the supernatural evaporates mirage-like into realspace – a magician’s trick, exposed. Still, it persists as a double-vision’d notion, a hybrid view of reality as both magic and physics, broadly confounding human understanding, discourse and decision. It’s a duality where the natural and supernatural are equally real and porous, seemingly able to allow physical passages back and forth. It’s a fantasy stunningly still mistaken for being real among a majority of the Earth’s population. Three panels, 160in x 14in. each. 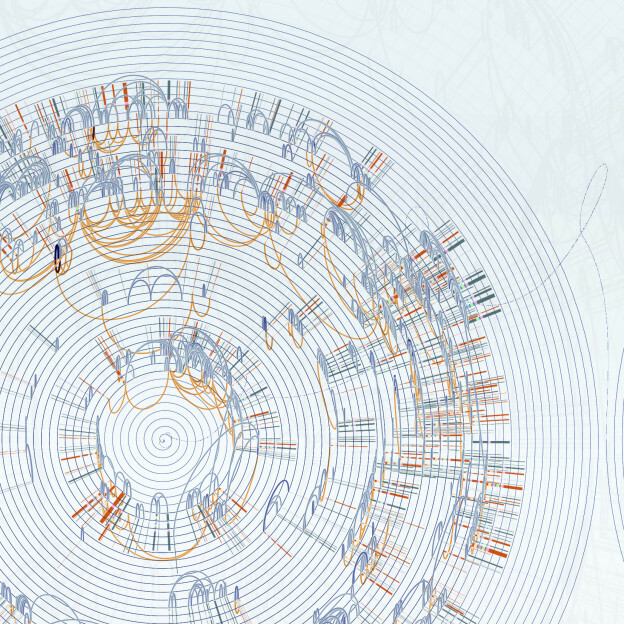 Contiguous visualization/ representation of complete mouse DNA sequence. High-res giclee on vellum; Courtesy of the artist. And art is, as it were, much to blame. Art is the illusionist, the magic-marker and image-maker for all things imaginary, including the supernatural. 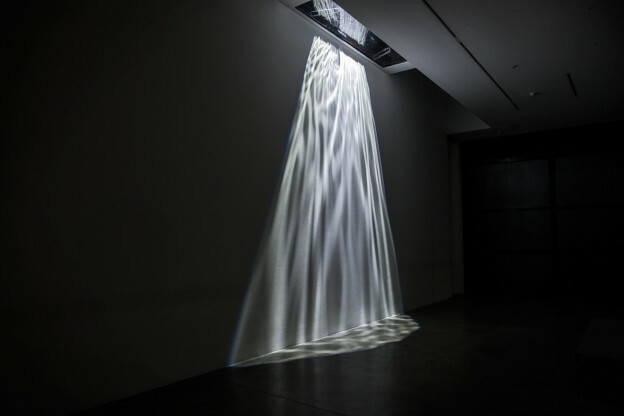 Without art – visual, literary, aural and oral – the supernatural would have remained as void of form through the centuries as it is of location. A fraud at being anything except art, the supernatural is a concept that might have aged into marvelous but unbelievable tales from our deep past had it not been convincingly fabricated and thus sanctified in art over great expanses of time, particularly in the spaces painters create. Virtually all of art’s long arc of history has been devoted to stockpiling the two imaginary spaces, fictional and supernatural, with the trappings of reality – anointing them with credibility appropriated by providing their unreal narratives with the familiar appearances of real ones. Feeding our placebo-like trust in the authority of that which looks real and is thus accepted as such, the supernatural was imbued with believability by dressing it up to mimic realspace. In painting, themes of the supernatural were provided even greater fidelity by the fifteenth century’s rise of vanishing point perspective, a sleight-of-hand that forced the painted surface to behave even more convincingly like a window through which onlookers peered into a real extension of our reliable world. That illusion of depth, what artists call pictorial space, is where the supernatural gained veracity by taking on forms we recognize and trust as symbols of what is true. Artistic skill enabled the realistic depiction of denizens and themes of the supernatural and helped convince viewers that the stories they told were indeed real. Art has always acted as the supernatural’s authenticator, its notary public. That is, until the latter half of the 19th century and the stirrings of modern art introduced a new skepticism into the doctrinaire reliability of appearances. Typically regarded as a seminal transition from representation to abstraction, one that flowed into the broad delta of twentieth century artistic movements, the era’s greater paradigmatic shift can be interpreted as decline of trust in worldviews that had been forged in art’s pictorial space, with a corresponding rise in the desire to locate aesthetic experience and meanings in real space. In the distance roughly between Paul Cezanne and Marcel Duchamp, perspective’s famous point transformed from one that vanishes to one that protrudes, eventually turning illusion inside out. Art had begun to question the sovereignty of pictorial space – and as that space dissolved, so did confidence in the veracity of the human narratives it had forged and given safe harbor over time. As a result, the byzantine scaffold supporting an alliance between the real and the supernatural in art began to collapse – a side-effect of nineteenth century artists’ journey to abstraction. The flattening of pictorial space and making of paintings that were real objects instead of illusionistic windows symbolized a recognition that structures of existence based in the imaginary were crumbling as new structures based in reality were emerging. Science, at least since Copernicus, had been doing the same thing. Blazing an earlier trail than the one traversed by art in the late 1800s, science had been incrementally placing into doubt imaginary narratives about how the world works, and replacing them with new understanding based in the real, natural world. Nineteenth century art’s introduction of themes that were repositioned from pictorial to real symbolized this same gradual turning point. It gave visual validation to a long-simmering existential change, metaphorically echoing the scientific replacement of the imaginary with the real, by moving aesthetic experience from the exclusive domain of pictorial space and relocating it to the untamed and uncertain wilds of realspace. Today’s impulse to pair art and science, a burgeoning international movement in the twenty-first century, reckons back once again to that seminal moment. The backlash among traditional artists and critics, and from the general population, to the advent of modernist art and science was due in part to the introduction of uncertainty into previously confident structures – structures erected by history and dominant for millennia, that enforced how the world works and how it should look when depicted as art. Scientific advances in the nineteenth and early twentieth centuries such as the theories of evolution, relativity, and quantum physics shook perceptions of reality with a high-Richter earthquake, and created new faultlines in the granite beliefs that had been enshrined for centuries within art’s pictorial space. A recognition of teetering belief systems enveloped both the arts and sciences, promoting skepticism and in turn motivating push-back from traditionalists that continues to this day. Tar on panels. 24×18 in. Courtesy of the artist. Photo: Chuck Spangler. So perhaps it was inevitable as the real came into greater focus and doctrines of the imaginary faded, that uncertainty would arise and earn the reputation of an interloper in those half-discarded former worlds of belief. What is certain is typically more desirable than what is not, but what is not certain is also the seed of curiosity, creativity, exploration and discovery, the siren call of knowing just a bit more. The places we’ve set aside for the fictional and supernatural persist in today’s imaginary spaces – but they are not real, and cannot contain the vast mysterious unknown whose beckon we feel so irresistibly. The natural, it turns out – realspace – is the infinite uncertain frontier where the magical, without the need of magic, is discovered. The supernatural is an oxymoronic entanglement that the arts must continue to unravel if they are going to pair with true science and assume with any integrity the mantle of ArtScience. Meanwhile, as it has always been despite conjured fantasies, realspace is where we actually live and what keeps the universe working – even as we’re creating, exploring, and discovering the wonders of where we live and how the universe works. 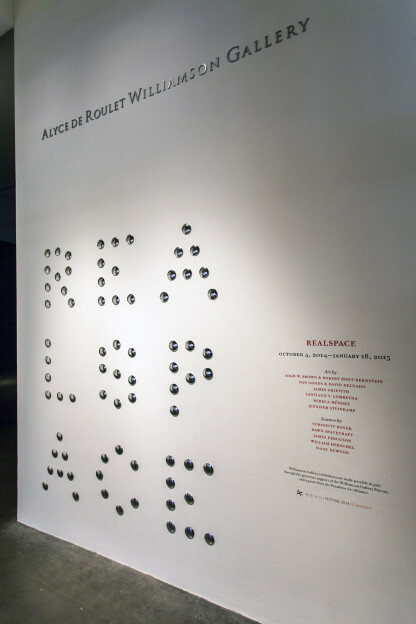 REALSPACE (Oct. 2014 – Jan. 2015) was an ArtScience exhibition at the Williamson Gallery, ArtCenter College, that included contemporary artists Adam W. Brown & Robert Root-Bernstein, Dan Goods & David Delgado, James Griffith, Santiago V. Lombeyda, Rebeca Mendez, and Jennifer Steinkamp; with science from Curiosity Rover, Dawn Spacecraft, James Ferguson (1710-1776), William Herschel (1738-1822), and Isaac Newton (1643-1727). Explore REALSPACE online at http://williamsongallery.net/realspace . 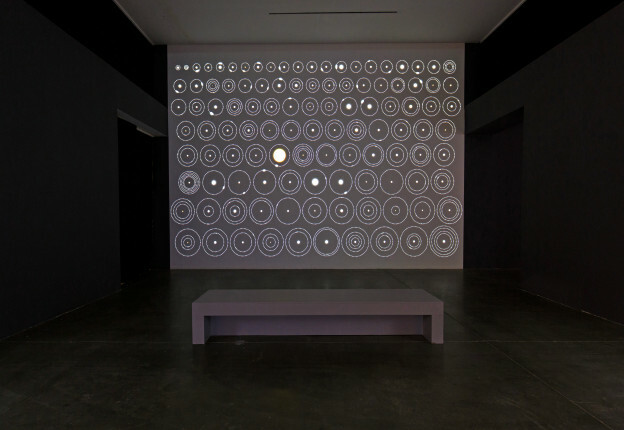 UNCERTAINTY (Oct. 11, 2016 – Feb. 12, 2017) at the Williamson Gallery features scientists and contemporary artists including Marc Fichou, Owen Schuh, Jonathan Corum, Lia Halloran, Jim Campbell, The Einstein Collective, Thomas McCauley for CMS, CERN, Edward Tufte, Richard Feynman, and Donald A. Glaser. Explore UNCERTAINTY online at http://williamsongallery.net/uncertainty . 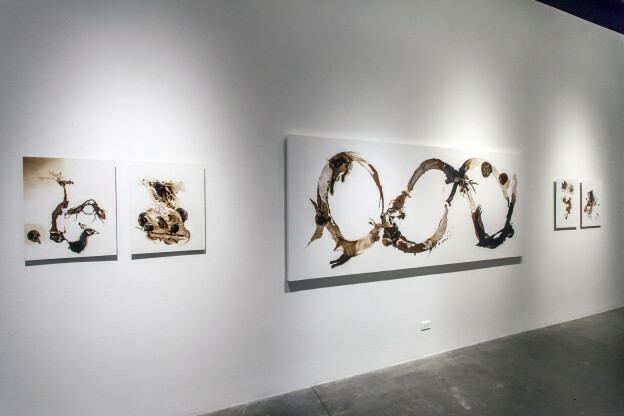 Stephen Nowlin is a maker/curator, and founding director of the Williamson Gallery at ArtCenter College in Pasadena, California, where he initiates projects at the intersection of science and art. For more information on his work: http://williamsongallery.net/google . I would be very interested in your comments about the books by Ervin Laszlo and also by Lothar Schafer – they turn you statement up-side-down and make the Akashic field (or something like it) the true, eternal reality and what you call Real as an ephemeral construction in-formed by the information field that is the Zero state of this universe. A summary of Ervin’s work (2014) is “The Self-Actualizing Cosmos: The Akasha Revolution in Science and Human Consciousness” but there are later ones (but a harder read). You might have fun with Lothar’s book “Infinite Potential: What Quantum Physics Reveals About How We Should Live” (especially read the Appendices for Chapter 1 and Chapter 2). http://www.amazon.com/Jesuis-Laplume/e/B00DCFMZD0/ (those are zeros, not Capital ‘o’s) so see if a copy and paste is more helpful. Hi, Jim — thanks for the comment, which I think is a very relevant one. When attempting a discourse on the poetic and transcendent dimensions of a scientific worldview, there is always the risk that one’s words will appear to promote a New Age spiritualist perspective. I haven’t read a lot of theosophy, but to the extent that I have been exposed to its notions and to those of other mainstream religious or fringe beliefs, I can only say this: by all evidence and objective instinct, we appear to exist in a universe whose mysteries and unknowns, when revealed, confirm there to be an entirely natural cosmic anatomy that governs things — not magic, not supernatural forces, not intent. To some mindsets, that reality is bleak and its uncertainties intolerable — but I would maintain that within the poetic grandeur of such a view awaits the consummation of all our species’ desire for deeper meanings. We’ve just been sidetracked by our ignorant past into the habit of looking elsewhere for it. Theosophy for me (while perhaps much better than the corrosion within ancient stubborn religions), is just one of those dead-end elsewheres. I have theosophist friends, by the way, friends I treasure. But nonetheless I find it specious that among the millions of living things on our planet and likely other planets somewhere, we humans speculate wildly and exclusively about our species’ eternal lives and extended consciousnesses, with the implication that we are more like gods than animals. We live for a short while, a wink in time, and when we die so does the individual consciousness life has gifted us. During that wink our biology permits sensations of transcendence — we should immerse ourselves in the wonder of that privilege, and use science, poetry, and art to know things and be thus fulfilled without the desperation of errant speculations. The academic world should declare war on such concepts of nature-denial as the supernatural and other quasi-supernatural memes. Such notions that plague and corrupt our comprehension and appreciation of things should go the way of Roman gods, witchcraft, and the Earth-centered universe — and be thus honored as obsolete endearments to our perennial curiosity and need to know. Sorry to get up on the soapbox a bit, Jim — I truly do appreciate your invitation to comment, the consideration and debate it inspires. Thanks reading my essay, thinking about it, and for the opportunity to respond.